When the Chicago Blackhawks owned the first overall pick in the 2007 NHL Draft, most analysts believed the team would choose between a 6’3, 210 pound forward named James Van Riemsdyk and a vertically challenged wing named Patrick Kane. However, when the Hawks opted for the diminutive scorer from from Buffalo, anyone knowing the history of the franchise shouldn’t have been surprised one bit. The first great sniper in the history of the Chicago Blackhawks was Mush March. A right wing listed at just 5’5 and 154 pounds, March had a knack for scoring big-time goals. When the Hawks won their first Stanley Cup in 1934, it was on a series-clinching overtime goal by March. 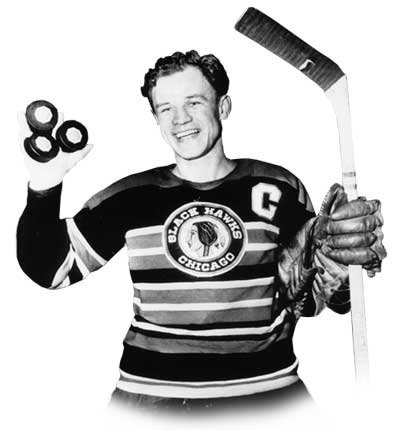 March spent all 17 seasons of his NHL career with the Hawks (1928-45), recording 153 goals and 230 assists in 759 regular season games. He is also remembered for scoring the first goal in Toronto’s Maple Leaf Gardens in 1931; he returned in 1999 to drop that puck in the final game at the Gardens. As March’s career came to a close, the Hawks again relied on small snipers to lead the offense. Starting in 1941, Bill Mosienko was the offensive force for the Hawks. Listed at just 5’8 and 160 pounds, Mosienko (also a right wing) was among the best scorers in the league. In 711 games with the Hawks, Mosienko scored 258 goals and added 282 assists. He won the Lady Byng Memorial Trophy after the 1944-45 season, an award that could have been named for him; Mosienko served only 121 penalty minutes in his career, including an incredible zero PIM in two seasons. He also set the record for the fastest hat trick in NHL history, scoring three goals in just 21 seconds on March 23, 1952 in New York against the Rangers. Mosienko teamed up with two brothers, Doug and Max Bentley, in the 1940s on perhaps the most dominant line of the decade. The Pony Line combined to post 416 points in 440 games over a three year stretch in an era where a 70-point season was rare. And of the three players on that great line, Max Bentley, listed at 5’10, was the tallest by at least two inches. Though his NHL debut came in 1951, Kenny Wharram didn’t lock himself into a spot in Chicago until the 1958-59 season. Once he was on the Hawks, though, Wharram would score a great deal. In 766 games with the Blackhawks, Wharram scored 252 goals. With the Pony Line, perhaps the most recognizeable line in Hawks history is the MPH line. Pit Martin was acquired in one of the more disastrous trades in the organization’s history (sending Phil Esposito to Boston), but he certainly performed well in Chicago. Martin, who was listed at 5’9 and 170 pounds, played in four consecutive All-Star Games and scored 243 goals in 740 games with the Hawks. Indeed, only two of the top ten goal scorers in the franchise’s long history – Tony Amonte and Jeremy Roenick – eclipsed six feet in height, while there is only one more listed as 5’11 – Dennis Hull. Three sweaters that have been retired largely because of offensive contributions – Denis Savard, Stan Mikita and Bobby Hull – were listed at 5’10 or less. If you haven’t caught on yet, the history lesson is simple: the Hawks have always received big contributions from “short” players.